Ordering at Unwind.com is always fast and secure. We want to make the shopping process as simple as possible. If you aren't sure about a price, feel to drop us a line at 888-486-9463 or click the "Pricing Information" tab near the top of this page to see all pricing levels for this model. Have more questions or prefer to order via phone? Drop us a line at 888-486-9463 or 1-601-932-5111 (Internationally). You can also chat with our Live Support Team. They are not just Customer Service Professionals, they are dedicated Ekornes Brand Comfort Specialists. They have the knowledge and experience to help pair you with the exact comfort technologies to help you truly relax and unwind. 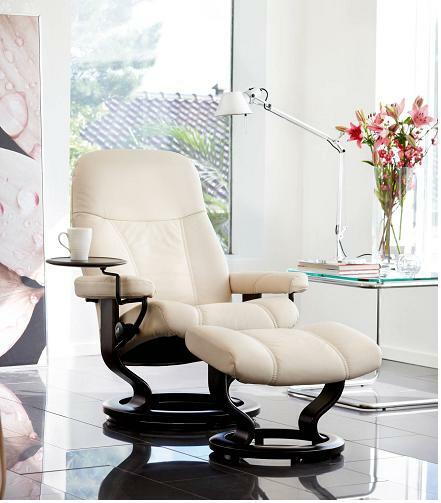 Enjoy Fast, Worry-free Delivery on a Stressless Consul Medium Chair with Ottoman. This popular, modern recliner delivers exquisite head, neck and back support and the over-stuffed smooth, soft, cushioning allows you to sit undeterred for many hours on end. 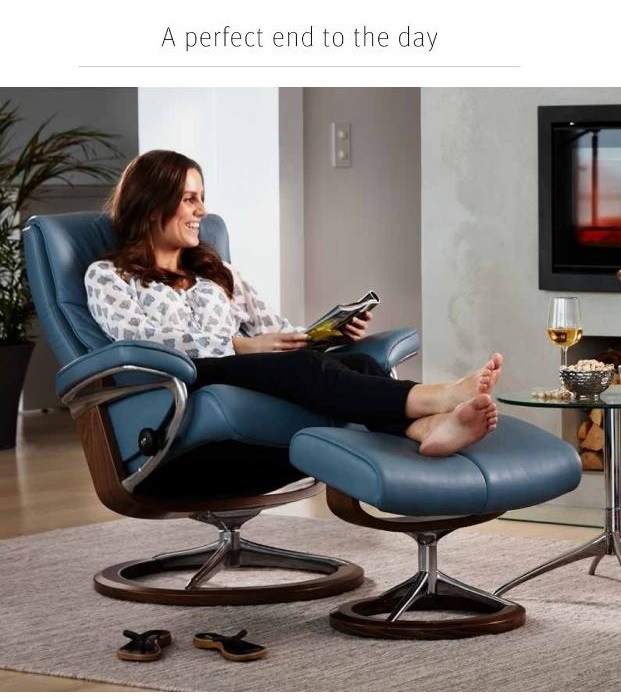 The Stressless Consul Medium recliner is among the most modern Stressless recliners available. The Consul is a medium sized model. It fits users of average build easily. It also appeals to those who are seeking an Ekornes quality seating solution and want something slightly more firm than average. The Comfort Zones allocate the cushioning to the left and right lower quadrants of your back. This is especially comfortable if you tend to feel tension and stress in your lower back first. The Consul, Diplomat and Ambassador models are typically stocked in Batick Leathers. This wonderful grade of leather is the basic grade. It is pebbled in its texture, has a thick layer of protective lacquer applied to its surface, and is slightly firm. One remarkable thing about Batick Leather, and other Stressless Leather Grades, is that over time a beautiful patina will form. This is due to ordinary use, age, and proper conditioning. View the Batick Leather Page for available colors. It is certainly a great time of year to purchase from the bestselling, economical Stressless Diplomat, Consul (and Consul Office), Ambassador lineup! This popular series delivers excellent head, neck and back support and the firm cushioning allows you to sit undeterred for many hours. This line is always popular among the budget-conscious, healthy-back furniture seeker. Stressless Consul Chair with Ottoman (medium size) Another Backcare Bargain- Shipped fully assembled and fast nationwide. Enjoy Inside Residential Delivery on the Stressless Consul- Save on delivery & sales tax benefits. Elegant, space-saving design makes the Consul a great choice for those with limited floorspace that won't settle for anything less than a Stressless Recliner. Got an RV with nowhere to comfortably park yourself? The Consul recliner is a perfect choice. Superior back, neck and lumbar support comes standard and helps the Stressless Consul Recliner cater to a wide variety of comfort seekers. Try one soon- Your back and body will Thank You for many, many years to come. Like its slightly smaller and larger siblings (the small Stressless Diplomat recliner and the large Stressless Ambassador recliner), the Ekornes Consul recliner displays a tight, polished, professional look. With the revolutionary back and neck-saving features that Stressless Recliners are famous for worldwide, the Stressless Consul is sure to please your back, body and pocketbook. The Unwind Company maintains an A+ Rating with the Better Business Bureau, with millions served since 1998. May we assist you as well? We'll always do our very best to get you taken care of- We guarantee it! Add a beautiful matching Stressless Laptop Table, Ekornes Ellipse Table, or Swing Table and you might learn that the Stressless Consul is your most comfortable and productive place to work. Why not save fuel and reduce back and neck strain at the same time? After all, that's an economic stimulus plan that we all can feel better about (and it only takes a few hours to begin working). - Ekornes patented their Plus System™. This ingeniuous technology provides continuous support for your head, neck and lower back. - In additiona to your back, your entire body can relax because your Consul Recliner is providing perfect balance and optimum support. - The Stressless Glide System allows you to automatically adjust to any seating position by simply using your body weight. - The incredibly sturdy and lightweight ottoman also features a built-in tilt system that adjusts to your leg and feet movements. - Stressless Recliners are created for a custom fit- Many of these recliners come in three sizes (small, medium or large) and many sofas are available in two sizes (medium or large). The Consul recliner is the "medium" recliner in the Diplomat, Consul, Ambassador Stressless line. It is no surprise that Stressless Consul Recliners are Exclusively Endorsed by the American Chiropractic Association (the ACA). Have questions or need additional information about the medium Stressless Consul recliner or other Ekornes furniture? Please contact us at stressless@unwind.com or at 1-888-4-UNWIND (888-486-9463). We're here to assist you with your Stressless Consul or other Soothing Back Product or Furniture purchase. Have a relaxing day!